Option A: Side Square Banner Ad* (£5 for up to 30 days, or £25 for 12 months) - Display your logo/ latest poster in the rotating square Banner Ads’ column displayed on the side of EVERY page on the #1 VINTAGE EVENTS FINDER with your own back link (e.g. to your website or social page or VINTAGE EVENTS FINDER listing), AND start displaying your Banner Ad with back link in every Thursday issue of the Vintage Lovers’ UNCOVERED Newsletter, as well as include in any one issue up to 2 of your events (from those listed on the #1 VINTAGE EVENTS FINDER) in the section on ideas of fairs and events to visit for the upcoming weekend. We'll also plug daily these upcoming events in the week leading-up across our popular facebook and twitter pages. 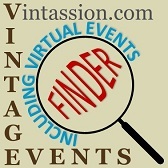 Plus we will post and tweet each of your event listings as soon as we publish on the #1 VINTAGE EVENT FINDER, and if you list your events on facebook we will also add them to the Vintassion facebook events page. Option B: Extra Daily Social Media Plugging (£5 per week per event) - To increase awareness, we can plug daily up to 2 of your listed events across our popular facebook and twitter pages for your selected week(s), as a standalone Option or in addition to daily plugging in the week leading-up to an event(s) when you also take up Option A. Option C: UNCOVERED Newsletter Feature (£15 per issue) - On a first come basis we can solo feature your events in the top section of our weekly Vintage Lovers’ UNCOVERED Newsletter, check out this example. Your feature will comprise one to three sentences with supporting image/ poster with back link and will be seen by several thousands of Vintage Lovers, as not only do we email the Newsletter directly to our 1,000+ subscribers but extensively plug the Newsletter including your feature on our popular social pages. Option D Leader-board Banner Ad (£15 per selected week) - Promote your event in the eye catching horizontal Banner Ad position on EVERY page of the #1 VINTAGE EVENTS FINDER with back link, which is limited to no more than 5 event organisers’ Ads at any one time (rotation order of Ads is on a first booked basis). Plus we'll plug daily your event across our popular facebook and twitter pages. Option E: Trader Late Availability or Offer Ad (£5 per selected week) - Attract more traders to your events with an eye-catching Leader-board Banner Ad at the top of the Trader Late Availability & Offers Page with backlink, which is limited to no more than 5 event organisers’ Ads at any one time. Includes us putting together artwork and plugging the Trader Late Availability & Offers Page daily across our popular facebook and twitter pages and in our weekly UNCOVERED Newsletter. Option D: Leader-board Banner Ad (one week or more runs up to a total of 3 weeks). Plus during the POPS 12 months whenever you wish to run more of Options C & D you receive a 20% discount off their normal price, making them £12 each (instead of £15). 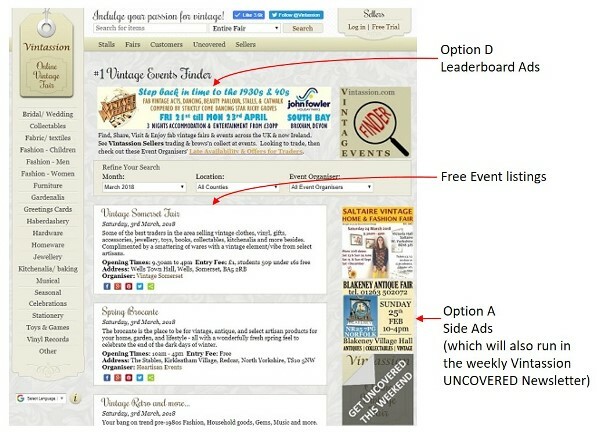 *Event Trader Showcase is provided at no extra cost when you run a 12 month Side Banner Ad (Option A) on the #1 VINTAGE EVENTS FINDER. In a nutshell your traders can help tempt even more visitors to your fairs by listing a selection of their lovely offerings for free at the Online Vintage Fair. Then the thousands of people browsing the #1 VINTAGE EVENTS FINDER every week will be able to see who is trading and with one click view all their tempting offerings - see how this works. Once you start running your 12 month Side Banner Ad we will email you a dedicated Event Trader Showcase webpage link just for your traders to start listing items. Please note we do not charge VAT and can quickly put together (usually within a day) at no extra cost your Banners Ads/ feature using your copy &/or images and information from your website/ social pages etc, and invoice as per the rates above via PayPal or BACS if preferred. We trust these promotion opportunities are of interest, to get started please email eventlistings@vintassion.com letting us know which Options you wish to take-up and prefered run dates. We would also be pleased to arrange a bespoke promotion package should this be of interest. Whenever you are looking to sign-up more traders you are welcome to list for free on the Trader Late Availability & Offers Page, just email details as and when. Your traders can help attract even more visitors to your events by listing a selection of their lovely offerings for free at the Online Vintage Fair. When they do, the thousands of people with a passion for vintage, retro, upcycled and handcrafted, searching the #1 VINTAGE EVENTS FINDER weekly will see together your listed events and traders’ Online Stalls; tempting even more to visit - everyone benefits! We'll then promote their Online Stall and your events daily in the week leading up across our popular social pages and in our weekly UNCOVERED Newsletter ideas section on events to visit. We wish you every success with all your events.